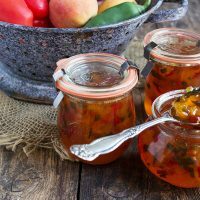 A delicious sweet and spicy jam, perfect with crackers and cheese, as a condiment or as a glaze for chicken or shrimp. Place peaches in a large, non-reactive pan. Combine peppers, lemon rind, cider vinegar and pectin powder with fruit in pan. Stir well to combine. Place on the stove-top over high heat and stir until the mixture comes to a full boil. Stir in sugar and bring to a full rolling boil. Boil hard for 1 minute, stirring constantly. Remove from heat. Skim off foam with a spoon and discard. Pour into clean warm, sterilized jars, filling to within 1/4-inch of rim. Seal while hot with sterilized lids. Process in a hot water bath for 10 minutes. Small-batch variation: Halve recipe and refrigerate in jars for short-term use. Apparently (like many things! ), some boxes of powdered pectin are now only 49g. Unfortunately, the ratio of pectin to sugar to fruit in this recipe still requires the full 57g in order for the jam to set. That may mean that you will need to buy two packages and use a full package and a portion of the second to equal 57g.